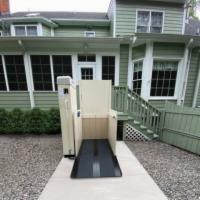 Porch Lifts are an ideal solution for those who eitherr don't have the room for a wheelchair ramp, or simply don't like the look of a large modular ramp leading up to the front or back door. A porch lift is actually a vertical platform lift that is usually installed under or beside the porch, allowing easy access for wheelchair users. 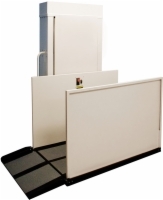 Heights can vary greatly for a wheelchair porch lift, but the concept remains the same. Give our porch lift experts a call for a free consultation and see how easy it can be to make your home more accessible with an AmeriGlide Wheelchair Lift for your porch.